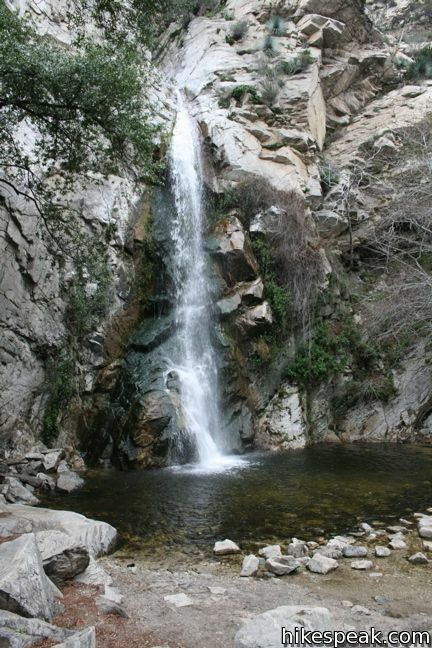 Sturtevant Falls is one of the finest waterfalls in Angeles National Forest. 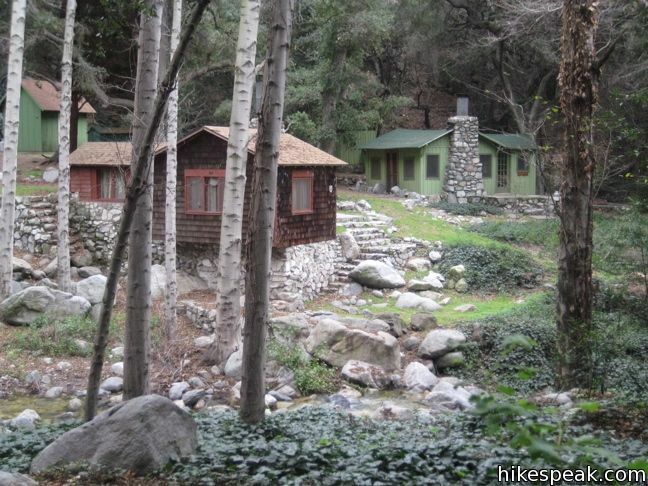 The 3.25-mile hike from Chantry Flats to Sturtevant Falls follows a pristine creek past resort era cabins. This is among the most popular hikes in the San Gabriel Mountains, and with good reason. 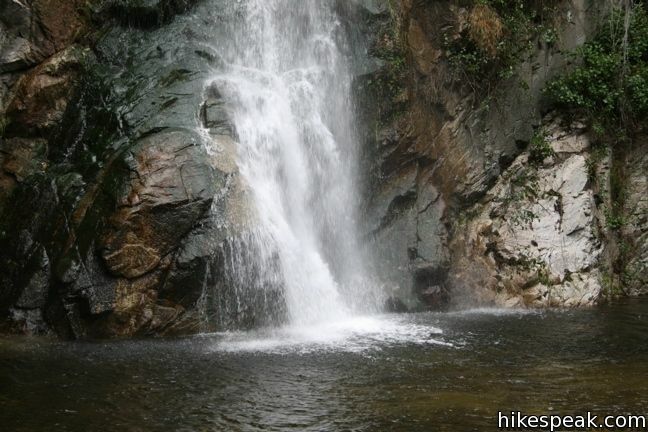 Sturtevant Falls is one of the Los Angeles waterfall hikes. To get to Sturtevant Falls, start from Chantry Flats and head down the paved road toward Roberts Camp, a quaint collection of quiet cabins surrounded by ivy-covered oaks and bays. This turn-of-the-century resort camp definitely isn’t abandoned, but you probably won’t see any of its residents. The hike kicks off with 0.6 miles of steep pavement as you descend to Roberts Camp and Gabrielino Trail. Variation: If you feel like you walk on too much pavement in Los Angeles as it is, you can take an alternate route down to Roberts Camp. Near the top, the road passes a junction with First Water Trail on the right. This dirt trail winds down the mountain and ends in Roberts Camp a little farther down Santa Anita Canyon. At the bottom of this trail, if you turned down the canyon, you would reach Hermit Falls, but if you head up the canyon, you can follow the creek past Roberts Camp cabins to join to the main trail. This route is one mile long, as opposed to the 0.6 miles down the paved road. From the end of the paved road at Roberts Camp, cross the bridge and come to a junction. Proceed straight, following the sign for Gabrielino Trail to Sturtevant Falls. To the left, Lower Winter Creek Trail leads to Hoegees Camp. Enjoy the calm sounds of the creek as you hike the wide trail up Santa Anita Canyon. Rock hopping is necessary at a few creek crossings, but what would a waterfall hike be without these? Three quarters of a mile from Roberts Camp, Gabrielino Trail splits off to the left toward Spruce Grove Camp. Pass through the junction and proceed straight up the canyon. After ascending 400 feet over 1 1/4 miles from Roberts Camp, you will be greeted by Sturtevant Falls, a sight that is worth the risk of a few wet toes. A large space at the base of the waterfall provides great viewing room for the 60-foot waterfall. 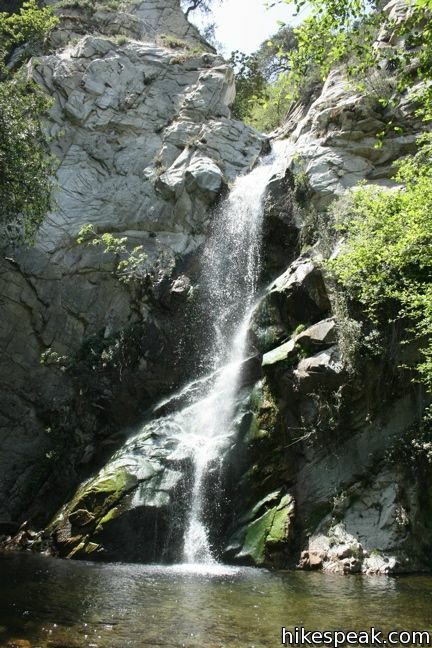 Sturtevant Falls is a beauty of the San Gabriels, tumbling down a green mossy carpet into a broad pool. 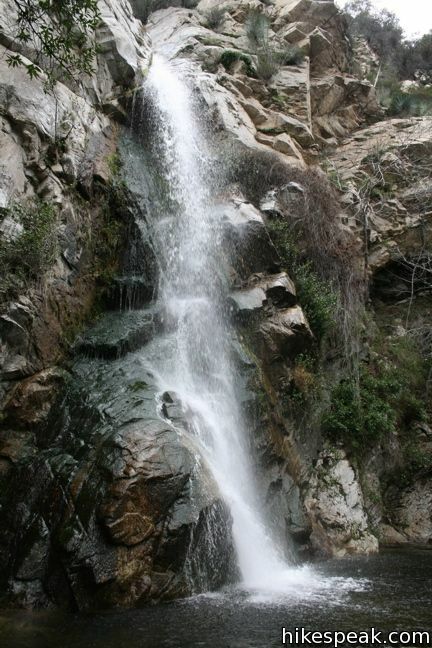 Pack a picnic so that you can enjoy an extended sit beside Sturtevant Falls before heading back out and up. 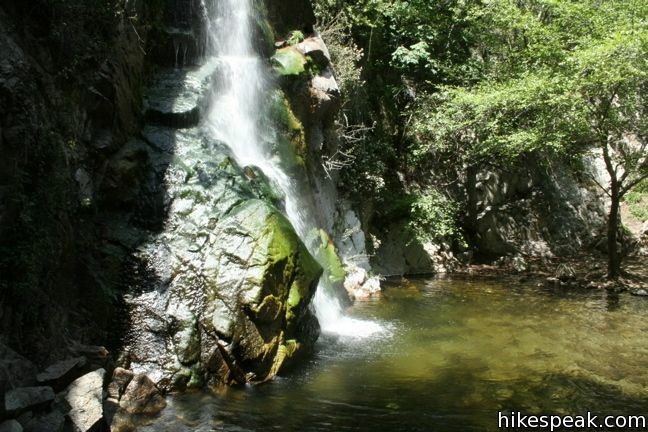 To extend this hike, continue beyond Sturtevant Falls on Gabrielino Trail to Spruce Grove Camp. Additionally, you could add a side trek from Roberts Camp to Hoegees Camp or Hermit Falls. 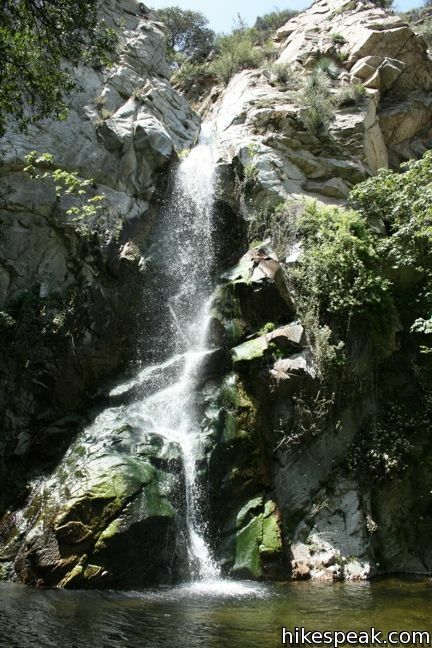 Sturtevant Falls may also be visited as part of the Santa Anita Canyon Loop, which is a great 9.5-mile trek into the San Gabriel Mountains. Dogs are welcome on leashes. A National Forest Adventure Pass is required for vehicles parked at Chantry Flats Trailhead. No permit is needed to hike to Sturtevant Falls, so get out and enjoy! To get to the trailhead: Take the 210 Freeway to Arcadia, east of Pasadena. Use exit 32 for Santa Anita Avenue and head north at the end of the offramp. Drive 5 miles up Santa Anita Avenue, going into the mountains. The road ends at Chantry Flats. These photos were taken in February and April of 2009. Click to enlarge. This 8-mile in-and-out or 9.5-mile loop takes hikers beyond Sturtevant Falls to a backcountry campground with seven first-come first-serve sites. This 4.25-mile hike follows Lower Winter Creek Trail through a beautiful wooded canyon to a backcountry campground with fourteen first-come first-serve sites. 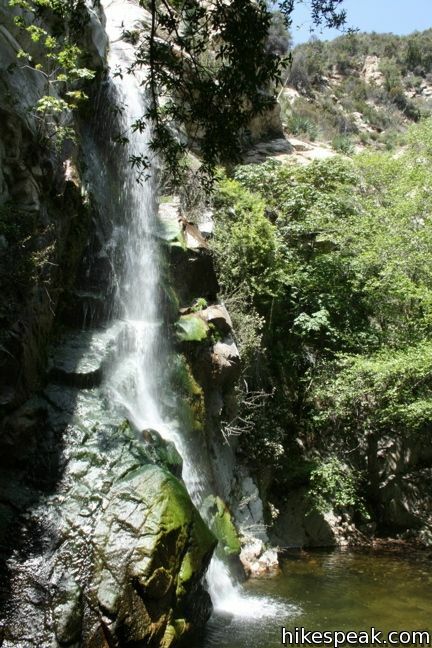 This 2.5-mile heads down canyon away from Sturtevant Falls toward a 30-foot waterfall. The lush canyon and the babbling creek are quite calming. This 9.5-mile loop visits two peaceful creeks in sylvan canyons, passing a 60-foot waterfall and plenty of beautiful wilderness. This 2.75-mile long trail can be used to extend Santa Anita Canyon Loop or create a 4.85-mile loop with Lower Winter Creek Trail. Explore other destinations in the range. This 4.8-mile round trip hike leaves from an active rock quarry and progresses up a beautiful canyon to a mesmerizing multi-tiered waterfall. This one mile hike visits a 50-foot waterfall up one of the most scenic canyons in the range. This 4.5-mile hike starts out above and finishes below a 50-foot tall waterfall. This 4-mile hike ascends a mountain-framed canyon to a 30-foot beauty on the east side of the San Gabriel Mountains. 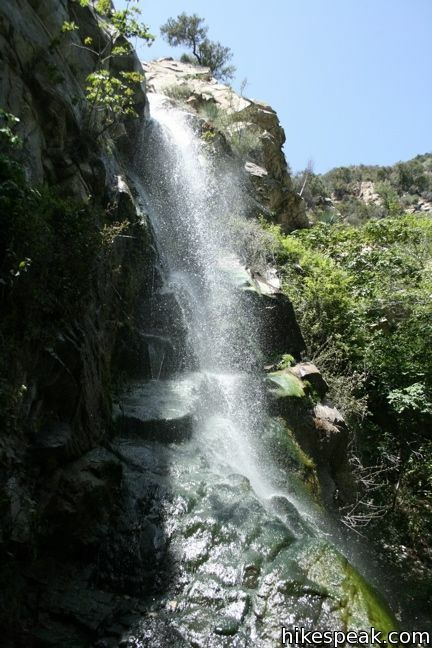 Explore other waterfalls in the Santa Monica and San Gabriel Mountains. We had an awesome time. This is a great place with spectacular views of waterfalls and wilderness and it’s really close to home if you live in Los Angeles County. 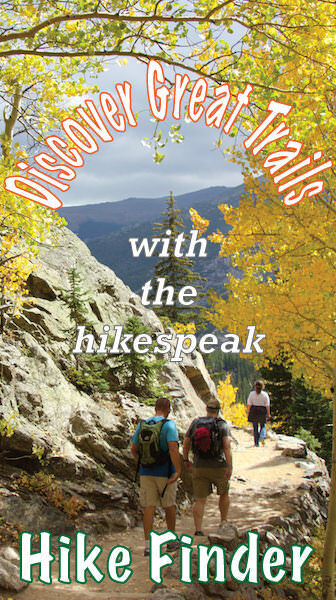 They have trails for beginners….like us and trails for the more experienced hikers too. No matter which trail you take I’m sure you’ll be in for a great time. Pack a lunch and don’t forget to bring lots of water. We can’t wait to go back again and this time we’re planning to hike a different trail. They have lots of them so don’t miss out on a good thing. See you there. Awesome map Chris! Thanks for producing it. I see it’s now available at REI. Hi Chris, Can you share a link to the app? I tried ‘Canyon Cartography’ but didn’t find it. Thank you! Sturtevant Falls, to date, has been my favorite hike. My goal is to hike/photography all the waterfalls in California. This particular hike was chocked full of such interesting history and was a pure joy to do. Will be making this hike many times. Hello Sassyred, all the waterfalls in California? What an awesome topic! Where are you displaying these photos? I love hiking trails with waterfalls. Do you have facebook? I’d like to see your pictures. Haven’t seen any, but i have seen a rattler on the trail. So beware of the hillside and stick to the trail. We saw a large mountain lion on our hike the other day. We were on our way back down from Mt. Wilson – so, quite a distance from the falls themselves. But, it is important to know that mountain lions are in the area and to know what to do if you ever encounter one (which I hear is rare). We had little knowledge when it happened…..but, not anymore! I don’t ever want to feel that helpless again. Hello, can anyone recommend a time for this hike on a Sunday? I’m trying to avoid the crowds and lack of parking as much as possible. I’ll be going this month. How do I obtain a National Forest Adventure Pass? All national forest ranger stations sell adventure passes and there are several other places where you can buy a pass like any Big 5 Sporting Goods store. Here is a national forest webpage with more info on where to get a pass. Hi does anyone know if the trails are open on holidays? like this 4th of July? Has anyone been up to Sturtevant Falls recently (Aug/Sept 2013)? Is the waterfall (and creeks) flowing…given how little rainfall we’ve had this past year? im thinking of going next weekend.. October 26/27 Same question as above regarding waterflow? We just went on a hike to Sturtevant Falls this past weekend (November 10, 2013). We arrived in the afternoon (around 1:00) and there was plenty of parking in the Chantry Flats parking lot (starting location for the hike)….many hikers were either leaving or already left. No parking fees because of the Veteran’s Day weekend. There were quite a few hikers on the trails and there is still a small flow of water in the creek. Sturtevant Falls still has water flowing as well…not very much, but it’s still a waterfall. We would highly recommend the hike. Very easy hike on well maintained trails and paved road (at the beginning of the hike). Does anyone know if dogs are allowed at Sturtevant Falls? Thanks! is there a fee for visiting with pet,and is there go carts we can rent? One of my favorite trails out here. Very photogenic with great sights. Sturtevant falls was looking a little dry but I also went during a very dry month. I would definitely recommend this trail. Do we still need an Adventure Pass to park in the main lot? I know they have repealed the need for a pass in a lot of places. Did this one on 3/27/2015. Fairly easy trail. Just a steep climb at the beginning and the end. Lovely walk through the cottage areas to the falls. It was moderately busy. The water levels are low though and look to be getting lower. Go now while it’s still nice! Can you tell me if there are any outhouses along the trail to the falls? 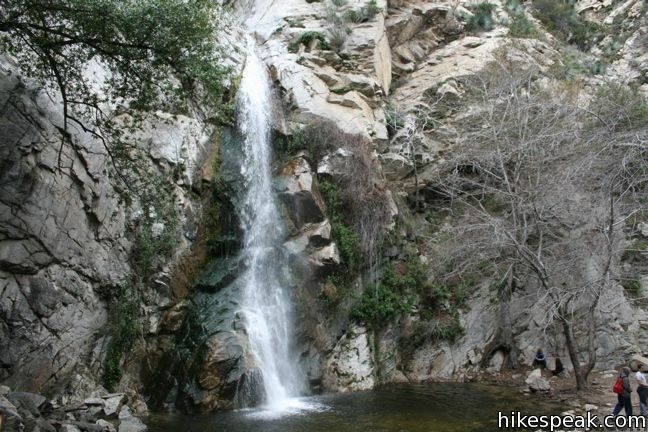 we are planning on visiting the Switzer Falls in the San Gabriel Mountains on August 31, 2015. Is there enough water at the waterfalls? Can you give a little bit more details on the alternate 1mile trail to avoid the paved road, please. Thanks. Yes, start by following the directions to Hermit Falls. Go down the paved road for 0.18 miles and, on the downhill side of a horseshoe bend in the road, turn right on First Water Trail. Take this dirt road all the way down to the creek, cross it, and turn left. Hike up along the creek to join Gabrielino Trail. Thank you so much for the prompt response. My 13 yr old son and I just went last Saturday. Used the First Water Trail going down the creek and it was so much fun. Will be doing it again, but all the way to Mt. Wilson the next time. Where can I get a parking pass to enter? Do I buy it there or before I get there? An Adventure Pass can be purchased at several locations, including nearby 7-11s and Big 5 sporting goods stores. You can also use the same interagency “America the Beautiful” annual pass that gets you into national parks. This hike is extremely crowded. We tried both SAT and SUN @ 6am and still there were already plenty of folks, parking lot already full plus parked cars along Chantry Flat Rd. Minimum 1+ mile hike up the Chantry Flat road (where you park your car to trail head). However, Sturtevant Falls still has plenty of water last weekend (6/11/17). Honestly, if it had not been for the woman at Adam pack store I would give this trail 5 stars. The paths are clear, lots of fun, and definitely a work out! We did the gabreilino trail (i think it was called) as an extension of the normal trail and on top of being a seriously magical view of the mountainside and several pools and waterfalls, it was clean and clear the whole way. As for Adams pack station, stay clear of the 2 dark haired dark eyed woman there (sorry to only have descriptions but I didn’t catch their names. They were very rude yelling and making fun of us and giving us a hard time because we didn’t know about their policies and were shocked by some of them, so we just wanted to get on the trail). She attempted to charge us an extra $70 for parking and left a terribly snarky note on our car after making fun of us for taking photos of our car for insurance purposes. Park on the mountain but don’t park there if she’s in, chances are you’ll come back with a cone behind your car and her attitude when you ask to speak to a manager instead of pay her an extra $70. Planning on going out there today (11/3/2018) I’m seeing a lot of posts about a parking pass, what are the details I should know before arriving to the falls? How was your experience? Did you pay the parking pass onsite? Is there any water this season? Is it possible to ride a mountain bike to the falls? With a trailer for my son? What time does the hiking trail open? ?